You have two ways of performing a hard reset on your Motorola Droid Razr (or Razr Maxx). The first wayis quite easy, as it is done from Android OS itself, so you only need to select the correct option from the phone’s settings menu and it’s done. The second way of performing a hard reset on your Motorola Droid Razr is a bit more complicated but bulletproof. It’s fulfilled by invoking the hard reset mechanism on a lower, basic level, pressing certain buttons while turning it on, in certain sequence. Both methods of hard reset will end up with your Motorola Droid Razr (or Razr Maxx) in a factory default state, just as if you just bought it. Consider before going any further that this includes deleting all your information, including contacts, messages, apps and games. Go to your android home screen and select the Apps icon usually located on the lower right portion of your phone’s screen. Once the settings menu pops up, chooese the “Privacy” option. Your Motorola Droid Razr may ask you your phone’s Password, or to draw the unlock pattern as a confirmation, and then it will proceed to reset itself. Allow it a couple of minutes to fulfill the task. Start with your phone in power off state. If it is freezed up and won’t turn off, take off its battery, wait for some seconds and place it back. Press and hold the Volume UP and Volume DOWN buttons and then press the Power Button. A menu will pop up asking you to select the Boot mode. Press the Volume DOWN to scroll down in the recovery menu and select RECOVERY option by pressing Volume UP over it. Select Wipe Data / Factory Reset and press the POWER button (note: Deleting all your data will take some time). Select Reboot System and press the POWER button to restart your Motorola Droid Razr. As you can see, when using the internal recovery menues, your volume DOWN button will allow you to navigate through its options. 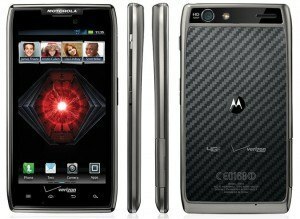 When finished you will end up with a clean, ready to use, Motorola Droid Razr / Droid Razr Maxx phone.